ENDING the Troubles in Northern Ireland stopped large scale violence, but lower level activity has lingered. Earlier this month, loyalists renewed their opposition to criminality. Now Paul Nolan reports how killings didn't entirely stop after the Belfast agreement in 1998, while few perpetrators have ever been convicted. THE killing of Ciaran Cummings on 4 July 2001 was described by the PSNI as "absolutely brutal." The 19-year-old welder was waiting for his usual morning lift at the Greystone roundabout in Antrim when a black motorcycle with a gold stripe stopped, and two gunmen wearing white and black crash helmets dismounted. He was initially shot in the back then, as he lay on the ground, one of the gunmen shot him again. Ciaran Cummings had no involvement in politics or with paramilitaries. He was, in the parlance of the Troubles, an innocent victim, and in a way that was the point. He was a Catholic and an easy target for loyalist paramilitaries who wished to send out a very particular warning at the time on the rerouting of loyal order parades. If his death is now forgotten by many that will fulfil the prediction made by the Bishop of Down and Connor, Dr Patrick Walsh, at his funeral. The clergyman said Ciaran would always be remembered by his family, but noted that for the wider public: "For a few days his name has been well known and on the lips of so many people, but after this weekend his name will soon be forgotten and Ciaran will be simply another statistic, yet another bare statistic, in the long list of victims of violence." The long list the Bishop referred to has continued to grow. In all, by April this year, a total of 158 people have died in what the PSNI (Police Service of Northern Ireland) refer to as security-related killings in the period since the Good Friday/Belfast Agreement was signed in April 1998. The ruthlessness with which Ciaran Cummings was dispatched has been more than matched by the dissident republicans. Political violence has been an ever-present reality in what is called, without irony, the post-conflict period in Northern Ireland. It wasn’t supposed to be like this. On 31 August 1994 the IRA declared a ceasefire, but it took almost four years for a comprehensive settlement to be negotiated. It is now 20 years since the Good Friday Agreement was brokered. While no-one wishes to use the term ‘acceptable level of violence’, the fact that the killings have for the most part taken place in out-of-sight deprived neighbourhoods means that they are a contained political problem, with only a small number of high profile cases attracting any significant attention. 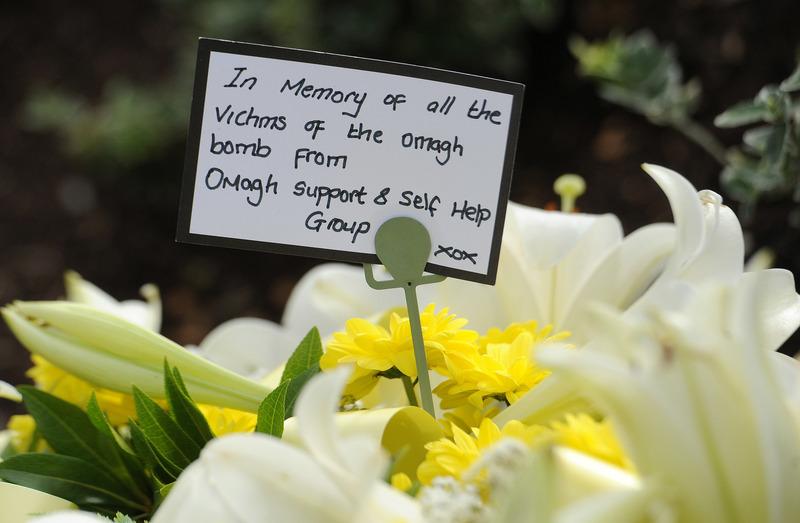 Twenty-nine people died when a bomb exploded in Omagh in August 1998. Whichever way the figures are counted the largest single victim group is Catholic civilians (a category that excludes republican paramilitaries or Catholic PSNI officers). This represents the continuation of a trend very marked in the 1968-98 period. In that period they constituted 32.4% of victims. In the period since 1998 the percentage share has moved up to 39.7%. The majority of Catholic victims were killed by republican paramilitaries. Out of a total of 62 deaths, 38 have been the victims of republican organisations operating within their own communities. Loyalists killed a further 22, and there were 2 killings where attribution has not been possible. The second largest victim category in the 1998-2017 period is that of loyalist paramilitaries, who make up 26.3% of all deaths. 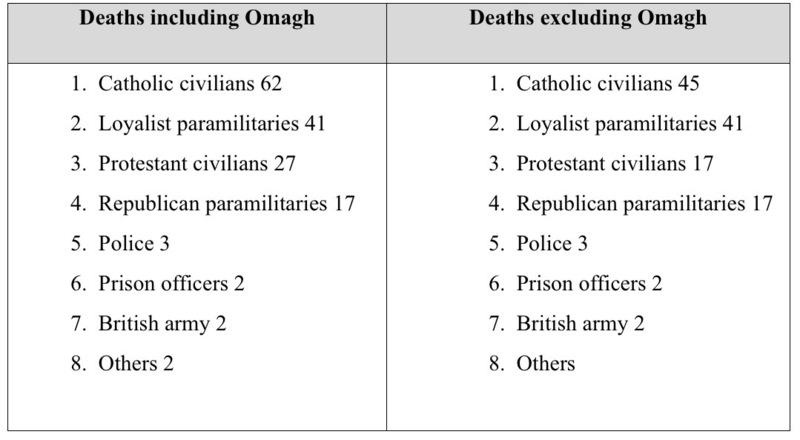 By way of contrast, loyalist paramilitaries made up barely 4% of deaths during the 1968-98 period. The other distinct difference with the Troubles era concerns the number of security forces killed. During that earlier period the deaths of British Army personnel, RUC, RUC Reserve, UDR, Royal Irish Rangers and NI Prison Service personnel made up a combined total 27.8% of all deaths. Since 1998 they account for just 5.5% of the total. Who has done the killing? This has been the period of the paramilitary. In the lists of security-related deaths no-one has been killed by a British soldier. No-one has been killed by a PSNI officer in security-related circumstances. Instead the violence has been visited upon the victims by paramilitaries in quite an intimate way: they have been known personally by their killers; they have lived in the same neighbourhoods or worked in the same workplaces. In a very large number of cases the killers and the people who were killed had been comrades in the same paramilitary organisation. The deaths include suicides believed to relate to paramilitary activity, but which cannot be attributed to a group. While the killings are evidence of a very divided society, only a few have been sectarian in the sense of people from one community killing a person from the other but there have been a number of instances of loyalist paramilitaries killing Catholics, simply because of their religion. For the most part though the victims of loyalist paramilitaries have been other loyalist paramilitaries - sometimes members of the same grouping, and sometimes of rival loyalist organisations. In total 41 loyalist paramilitaries have been killed. In every single case the perpetrators were other loyalist paramilitaries. Republican paramilitaries have not engaged in feuds in the same way; instead their victims have tended to be those in their own communities who were unlucky enough to cross their paths. Crime without punishment: does anyone go to jail? No-one was ever charged with the murder of young Ciaran Cummings. That does not make his case unusual; on the contrary, in the vast majority of cases the killers go free. In fact just 11 people have been imprisoned for murder and 5 for manslaughter for all the killings that have taken place over the past 20 years. This is despite the fact that in almost every case the PSNI and the gardaí feel confident they know the identities of the perpetrators. Securing a conviction is a different matter. Witnesses are simply too afraid to give evidence in court, and so even in those rare cases where a prosecution succeeds the convictions tend to be of those on the periphery of the case, not the trigger men or the leaders of the murder gangs. Any estimate of the number of people involved in the security-related killings that have taken place since 1998 is bound to be speculative, but with a conservative estimate of seven or eight people involved in one way or another in the average case, and even allowing for the fact that some gang members were involved in more than one murder, it is likely that the total number may be close to 1,000. Or, to put it another way, the conviction rate for all these killings is below 2%. For the relatives and survivors in all the other cases the absence of justice has meant a very cruel peace indeed. Paul Nolan is an independent researcher who writes on the Northern Ireland peace process and the problems of post-conflict societies. He is also a member of the Northern Ireland Policing Board, though writes in a personal capacity. This article forms part of a project marking the 20th anniversary of the Belfast/Good Friday Agreement produced by The Detail with Queen's University Belfast.